I'm still exhausted from fair day - maybe I'll write something substantial later, or maybe I won't. We'll see how motivated I feel. For now, I'd like to talk about a great challenge I am taking part in: Drop Dead Gorgeous by December, a four month long non-weight related challenge by Half of Jess. I have been reading about some challenges - I'd really like to take part in some, and I think this is a great starting point. Yes, you share your weight, but the real focus is on celebrating how gorgeous you are inside and out - just what I need right now in my journey! The challenge runs from today, 8/22, to 12/19. So, here is my first update! 1. A picture of you holding up a positive sign for yourself. 2. Your current week’s weight as well as your challenge start weight. 3. Your goal(s) from now, or whenever you decide to join, until December. (1) Try a new recipe at least once a week. (2) Write handwritten letters to my sisters. (3) Save $50 a month towards a vacation next summer. (4) Let my family and friends know often how much I love them. 4. ONE thing that you are proud of for the week. This week: starting my first real grown-up job! I have an office! And it doesn't hurt that it's in a high rise with an epic view of downtown Chicago! 5. ONE thing that you can improve upon for the following week. Managing stress when the REAL work starts! Hey! I'm so excited to start DDGBD with you. I'm loving your picture, and your goals look great. Best of luck! 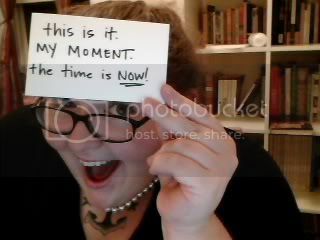 This is your moment!!! Cherish it and LET's DO IT!!! Looking forward to DDGBD! Love the pic!!! I'm in on the challenge too! Congrats on the new job - I would love to have a view like that, though it might make it harder for me to concentrate on my actual work! Ha! Good luck on your challenge! What a great idea. I'm participating in the DDG Challenge too! I am super excited to find new blogs and people doing the same (but different) journey as me! I'll be following along now too! 31. One-time loser of 155 pounds, trying to get it back after baby. New Englander transplanted to the West Coast by way of Chicago and South Carolina. French teacher. Blogger. Tattooed. Foodie. Nerd.